easy vegan muffins that actually, you know, taste good. | joie de vivre! ← happy 1st day of summer! easy vegan muffins that actually, you know, taste good. I don’t want to admit which famous-actor-gone-cook from whom I stole this recipe because her foray into country music left me feeling awkward for her. However, I flipped through her cookbook the other day and was impressed by the simplicity, creativity, and health of the recipes, so I can’t mock her too much. Conclusion: I think she may actually be a good cook, and these muffins are tasty and far healthier than the usual variety, as they have no refined sugars, flours, or saturated fat. And they’re moist. (Between you and me, the word “moist” creeps me out. But it’s true!) Whenever I’ve made vegan muffins in the past, they were never quite right. Something seemed to be missing. But I would never guess that these were vegan or really any different from a standard muffin. I made a few adaptations based on what I had on hand. You can use whichever berries you prefer (the original recipe called for blueberries), even frozen. Fresh berries are so expensive that I usually opt to use frozen berries in baked goods. However, word to the wise if you use the frozen variety: toss the berries with a little flour to soak up extra moisture. Otherwise, you can be left with some unsightly muffins. 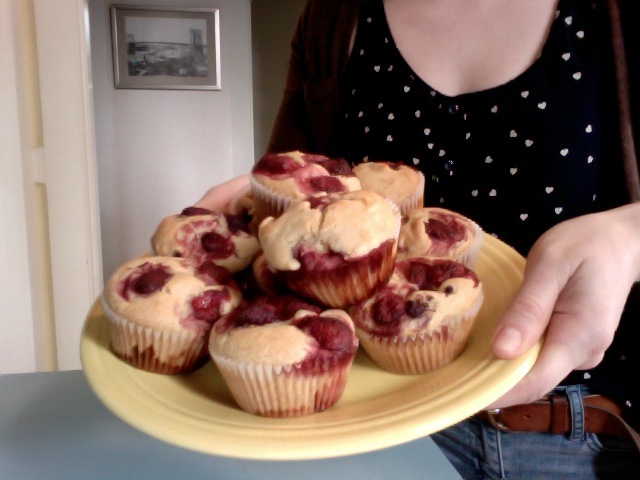 Alternatively, you can place frozen berries in the muffin tins as you add the batter, instead of mixing all together, to prevent the color from the berries dyeing the batter. Heat oven to 375°. Line a 12-cup muffin pan with paper liners. Whisk oil, soymilk, syrup, and nectar in a bowl. Combine flours, baking powder, and salt in another bowl. Stir wet ingredients into dry ingredients; fold in berries (if using frozen, see above). Divide batter evenly among muffin cups. 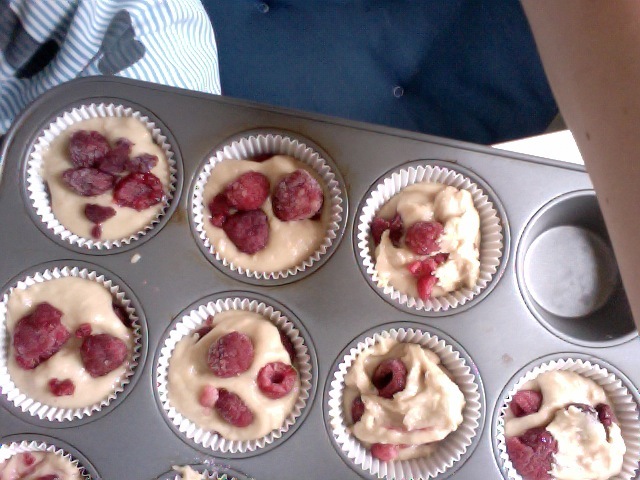 Bake until muffins are golden brown and a knife comes out clean, 25 to 30 minutes. And what music accompanied the baking of said muffins? you may ask. (Or not. But I’m going to tell you anyway.) Some good ol’ hippierific music by The Avett Brothers. YUM! These look so good. And I completely agree about her singing career–seeing her perform makes me cringe!